Navigator is coming to the Loddon Campaspe Area in 2019. Anglicare Victoria will be providing the Navigator program. Campaspe Cohuna LLEN actively lobbied for at least one worker to be based in Campaspe and Anglicare supports this. 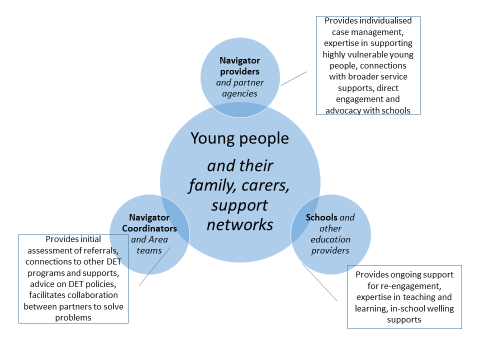 Navigator supports young people who are not attending school or struggling with attendance - connecting each young person with a case worker who can provide access to a range of support services and create a path back into education. Navigator is a hands-on, proactive service delivered by schools and community agencies to improve outcomes for young people, linking them to support services and interventions, and supporting them to re-engage with education and training. The Loddon Campaspe Area consists of six local government areas, extending from Campaspe to Macedon Ranges. Gannawarra is already serviced by Navigator provided by Murray Mallee LLEN, and that program will continue. Mentors have been recruited and trained in Kyabram, Echuca and Cohuna to be MATES mentors to secondary school students. More volunteer mentors are always welcome. The ongoing commitment is for one hour a week during school terms. We provide training and ongoing support. You will need a Working with Children Check (free for volunteers) and we can help you with applying. You can complete the training before deciding whether to commit to the program. If you are interested in becoming a mentor please contact us for an information pack. The Challenge is an industry standard cooking competition for secondary school students enrolled in a Vocational Education and Training (VET) Hospitality Training Package. The Murray River Culinary Challenge is a three tiered competition. At the school level, students compete individually to vie for a spot in the Regional Final. The two top scoring students from each school are paired and compete as a team in the Regional Final, the top scoring team then progressing to the Grand Final. Menus in each level of the competition become progressively more difficult and are designed for students to be able to demonstrate their skills learnt during their hospitality training. The Challenge spans four regions and will involve more than 150 students attending 20 schools from Campaspe, Shepparton, Swan Hill and Wangaratta districts. Moama Bowling Club has been a long term sponsor of the Murray River Culinary Challenge in the Campaspe region and this year is again the major sponsor of the overall competition. Thank you to the Moama Bowling Club for their generosity and support. 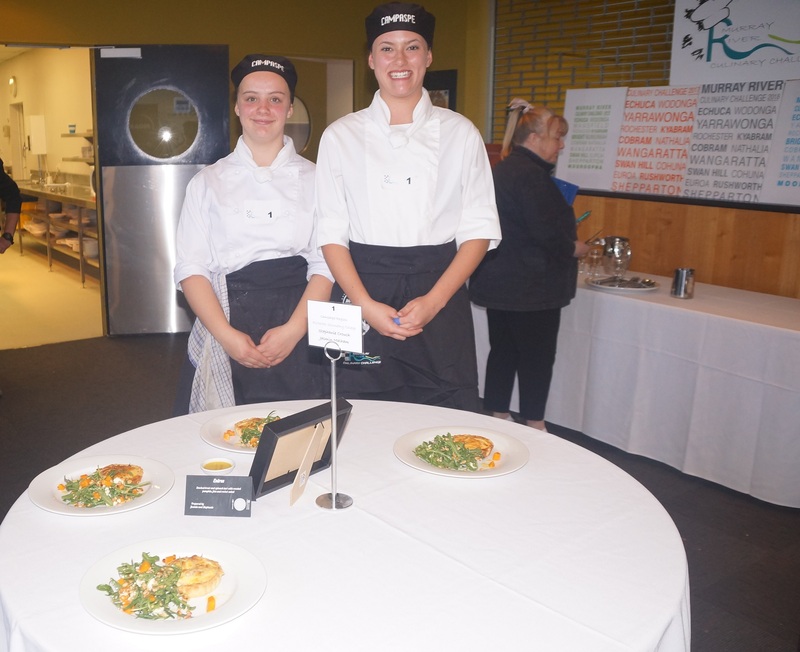 The Regional Cook off between teams from Echuca College and Rochester Secondary College resulted in the Rochester duo of Stephanie Crouch & Jasmin Malham becoming the Grand Final team for Campaspe region on Wednesday September 12. No pressure for Stephanie who is the third Crouch girl to represent Campaspe in a Grand Final, with both her sisters winning in previous years! Campaspe was joined by teams from Murray Mallee, Goulburn Murray and Wangaratta regions who enjoyed a viewing of the Kickham’s Mill kitchens at TAFE and a dinner with trainers and judges. The menu, on practice by each region, was deemed a little more difficult so an extra 15 minutes was added into the main course presentation time. Each student had just 2.45 hours to present 3 dishes designed to display knife skills and basic methods of cookery. The industry judges were looking for consistency, flavour and were certainly impressed with the creative presentation from the students. A big thank you to our Industry judges George Santos Moama Bowling Club, Rebecca Hart Boo’s Place Café & Providore and Megan Knapp of The Kitchen Door. This dedicated trio has between them 28 years of judging the Challenge and they approach every year with clarity and passion. The feedback to the students is invaluable. Wangaratta region were the winners on the day but it was a very close race. The coveted Murray River Culinary Challenge trophy, a piece of highly polished red gum sourced from the Koondrook forest, is now residing with the reigning champions, at Wangaratta High School. You can see more about the Challenge here, and follow it on Facebook here.